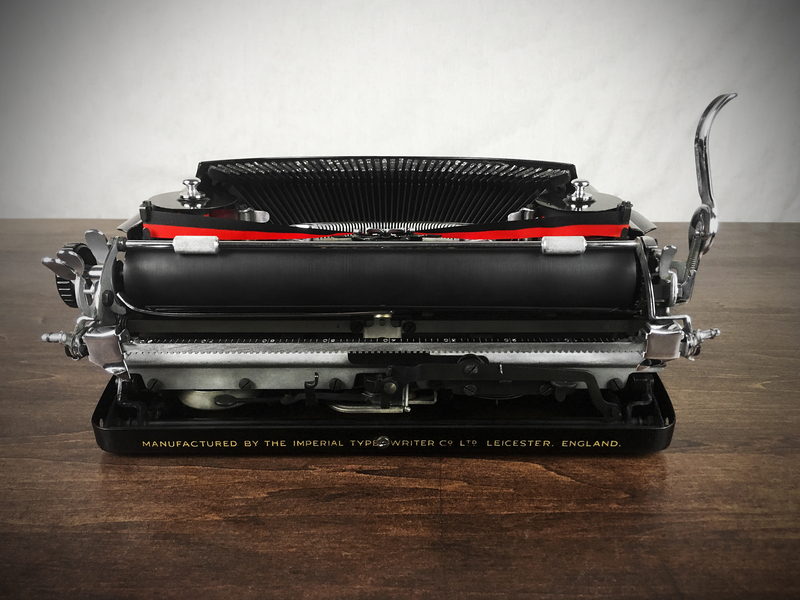 Offering a 1930s Art Deco Imperial ‘Good Companion’ Portable Typewriter in impeccable condition. It’s been fully refurbished, with original high gloss black paint. The Imperial portables from this era were all hand assembled to a high level of excellence. It shows minor signs of use and everything works flawlessly. The typewriter received a meticulous cleaning, servicing/adjustments, and a new ribbon. It was disassembled for cleaning. The chrome plating is in excellent condition, with only minor signs of use. All the original paint has been carefully cleaned, polished and waxed. A very high quality wax was used on the paint for a deep “showroom” shine. 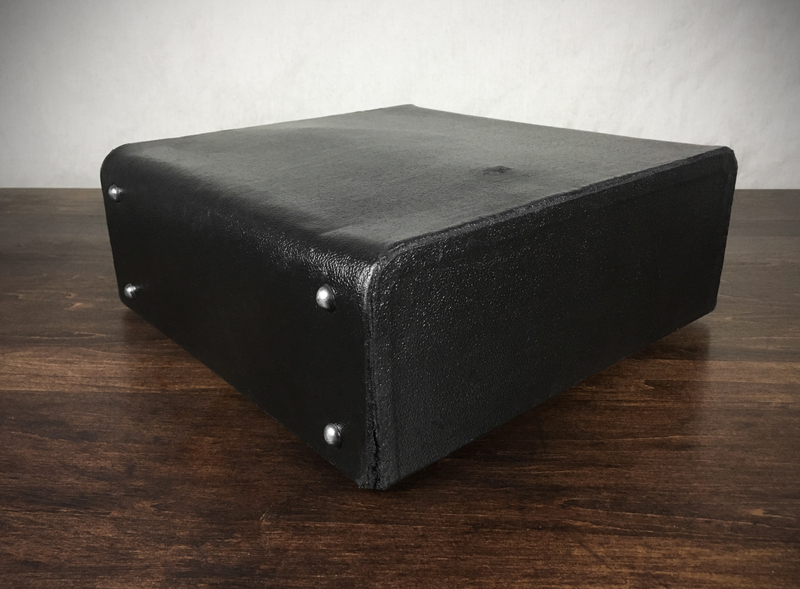 The rubber platen is in fine condition. There’s a significant historical value to these early Imperial portables in this level of condition. 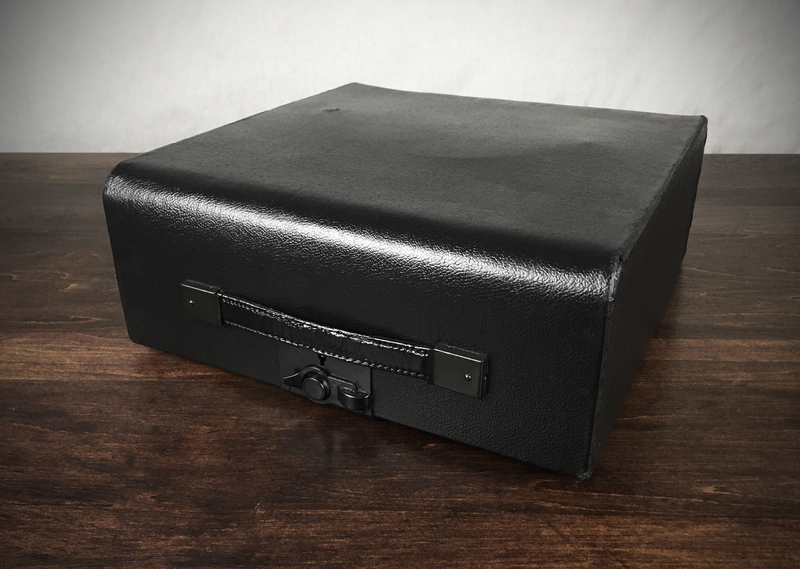 The typewriter comes with an original carrying case, which is in good condition for its age, with wear to the corners and some surface wear. The carrying case has a very nice clean felt interior. The original leather handle has some wear from age, but is reinforced by a steel core, so it’s very sturdy. The typewriter comes with a high quality reprint of the original manual. It takes many days to refurbish a typewriter. It’s ready for regular daily use. There are very few early Imperial models around in this level of cosmetic and functional condition. The typewriter is a joy to use. 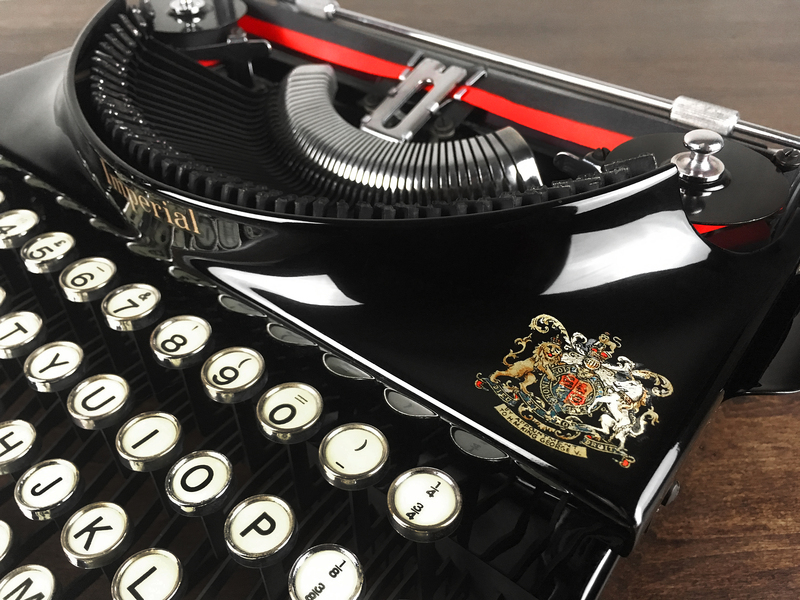 The Royal Warrant displayed on the right side was awarded to the Imperial Typewriter Company by His Majesty King George V, for their ingenuity and beautiful Art Deco inspired styling. 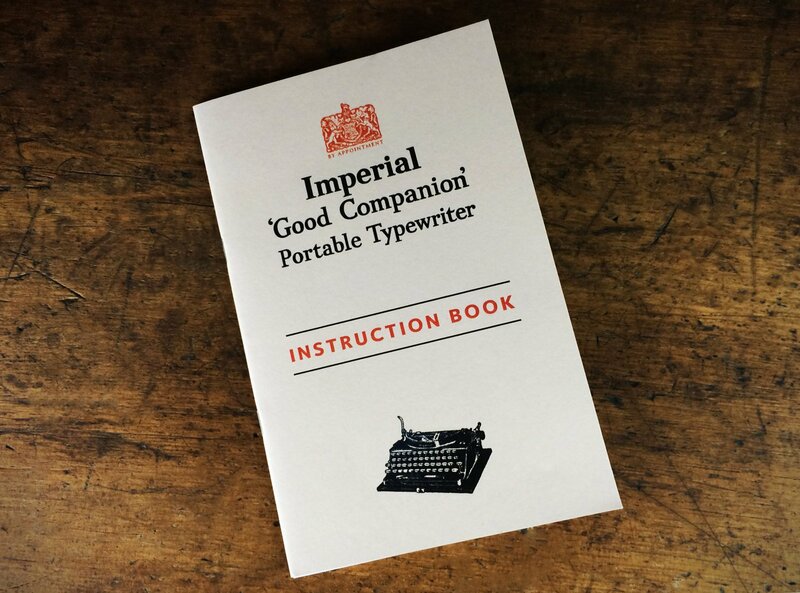 The Imperial ‘Good Companion’ captured the hearts of writers & musicians, including Ernest Hemingway and John lennon. 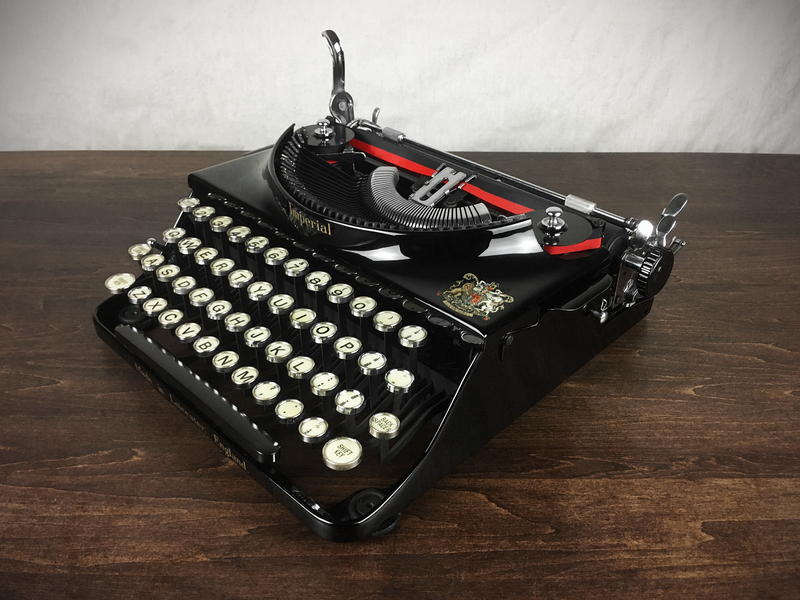 This portable typewriter is an exceptionally well designed machine with stunning luxurious looks, but is also an important piece of history from the WWII era. A rare find in this condition. 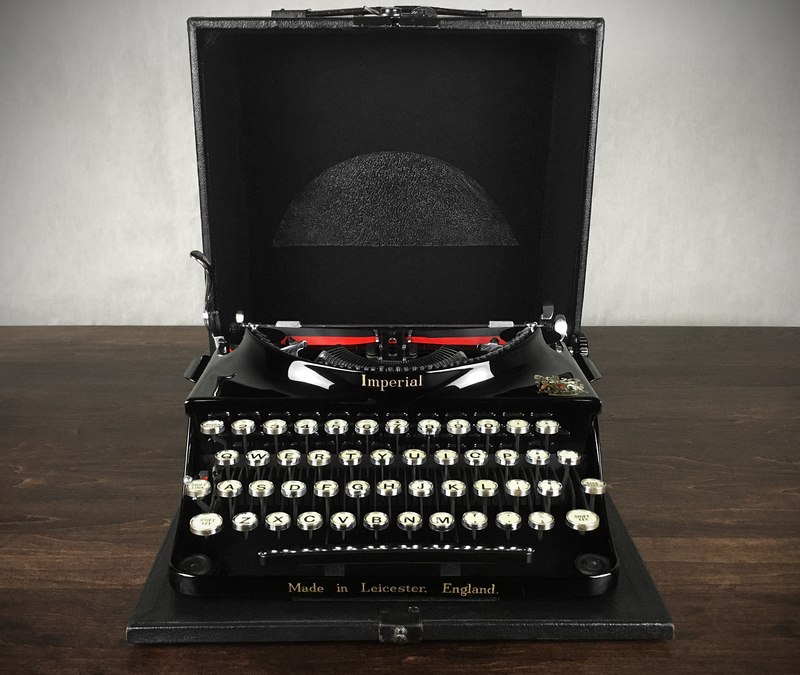 The early portable Imperials were considered the Rolls Royce of typewriters. The typewriter draw band (carriage cord) comes with a one year warranty against breakage. If the draw band should ever need replacing, we will replace the draw band. Shipping not included for this warranty coverage. The warranty is available to buyers within the US only. 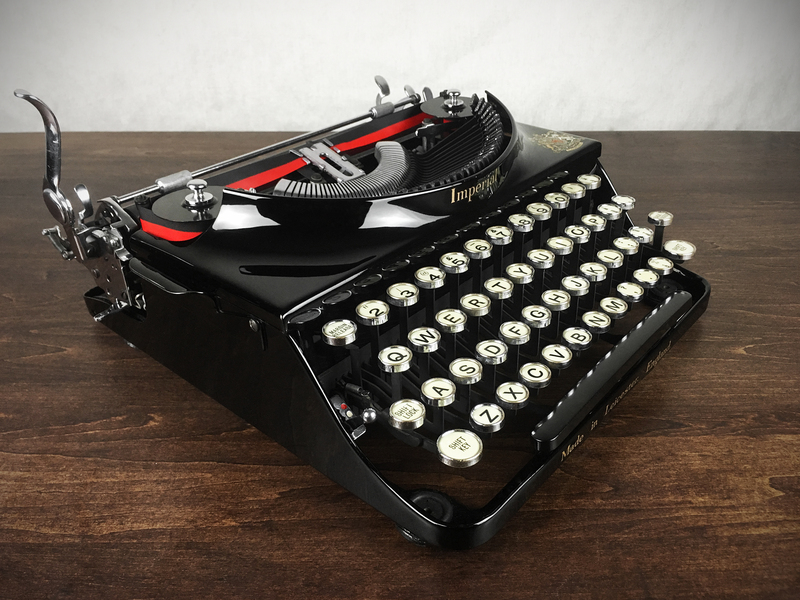 Note: The typewriter will be professionally packaged and ship fully insured via UPS Ground within the US. Note: International shipping by request only. Please be in contact for exact international shipping rates to your country. Additional shipping fees apply to Alaska and Hawaii.